Sometimes, the stuff of nightmares find you. 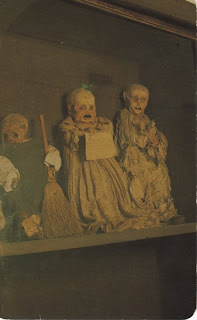 This might be the creepiest damn postcard I have ever received, but more on that in a minute. In speculative fiction, its hard not to write the gruesome and visceral, but so often, that becomes the focus. Without care, a story can get lost in the details of pain and tragedy, and ignore the real goal, which is to scare people. Describing a scene of violence or terror is simply not enough. I want people to leave the hallway light on at night after reading my stories. This is where Nightmare Fuel comes in. Nightmare fuel is taking something that isn't meant to be scary, but corrupting it into something terrifying. Usually it involves the familiar and comforting aspects of everyday life, or an object of childhood memory. Sometimes it is simply a mannequin that creeps a little too close to the uncanny valley, or a clown toy, smiling insidiously as you try to sleep. Oftentimes the complete unknown isn't enough to leave a resonating scare; the tainting of normal objects and perceptions can leave a much deeper impression. On the other end of the spectrum, there are plenty of real life terrors out there. Some far worse than our imaginations have come up with. We only need to look at the events in Tucson this past week to see that. Beyond the psychopaths, there are limitless amounts of fuel for horror and despair. The postcard at the top of this post is a little beyond nightmare fuel. It has its own reasons to be scary, and not because it is a disturbing picture. I found it while going through some of my Grandmothers things. According to the back, it was made in the late 70s, and comes from a small museum in Mexico that displays the bodies exhumed from a cemetery. The reason for the exhumation was the families being unable to pay the three death taxes that the church levied on the residents. Imagine it, a child dies of small pox or an accident, and through the family's grief, someone sticks their hand out demanding payment. And then they do it once a year for the next three years, and if you don't pony up that dough, they dig up the deceased, and put them on display. They become immortalized as tourists from richer countries come to gawk and take pictures of their leathered skin and hallow eye sockets. This story does not have the immediate danger or survival element that is needed for a good story, but it can still be terrifying. Adapting these real life horrors into writing, even if the truth and eventual fiction are worlds apart, can lead to more believable and influential stories. Often tiptoeing the lines between horror and the surreal is the nature of our waking lives. Inspiration for the audacious and the terrible can be found on the news, in our bedrooms and closets, or the dusty museums of other countries. Images of the dismal exist right alongside the comforts of civilization, and it would do all of us writers well to keep our eyes open to them.